Terrified And Alone: Imagining Life Without My Sweetheart : The Baby Project Jeff Pike recounts his moments in the waiting room as doctors urgently operated on his wife, Andrea, after she had a C-section. At one point, a nurse said to him, "In times like this, we sometimes recommend that you call and have a family member here with you." 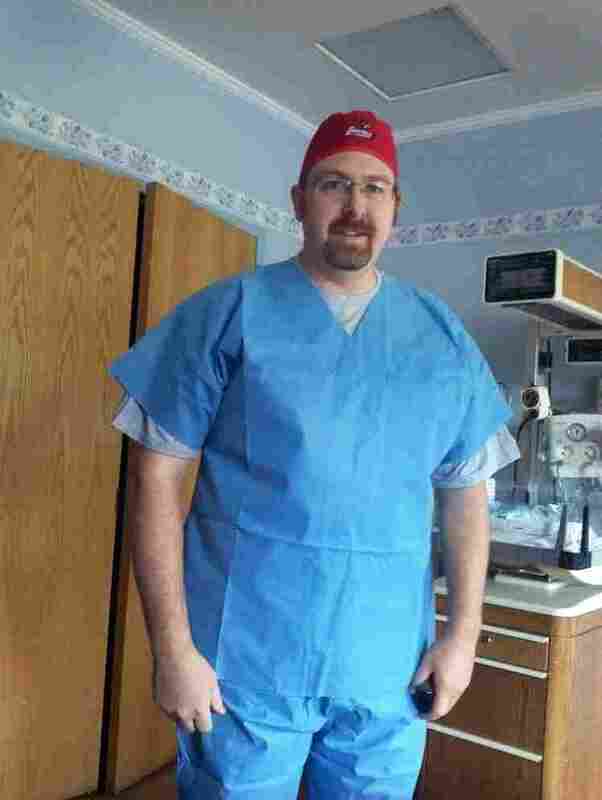 Jeff Pike puts on scrubs as his wife, Andrea, is taken in to surgery for a C-section. Earlier today, we posted the first part of Andrea Pike's birth story, from Andrea's perspective before she blacked out. Here, her husband Jeff picks up where she left off, in the operating room just before Andrea had a C-section to deliver the second twin, Elizabeth. It wasn't a panicked cry, it wasn't desperate, it wasn't meek. It was authoritative, given in a tone that told me Dr. R has been here before, and although she was having trouble, she was not about to lose control of the situation. "Call for help" — the command came once more. A couple of nurses rushed out the door. A couple more people rushed in. I was standing on the far side of the operating room, away from the door and trying my best to contain my joy at having just seen my second daughter pulled (literally pulled) into this world. I had a few moments to say my first hello to Elizabeth as she squirmed in the Tupperware tub under the warmer. Natalie, having been born a few minutes before, was comfortably wrapped in a blanket in her Tupperware tub. All of the focus was on Andrea now. I knew that the C-section was difficult, but I wasn't afraid during the procedure. It's not for the faint of heart: There's nothing romantic or cute about seeing someone cut open to extract a baby, but Dr. R's grip on the procedure, and the speed and precision with which everyone in the room acted once the C-section directive was given, was comforting in a strange sort of way. Andrea Pike, 31, from Union, Ky., gave birth to twin girls Natalie and Elizabeth on Aug. 3. 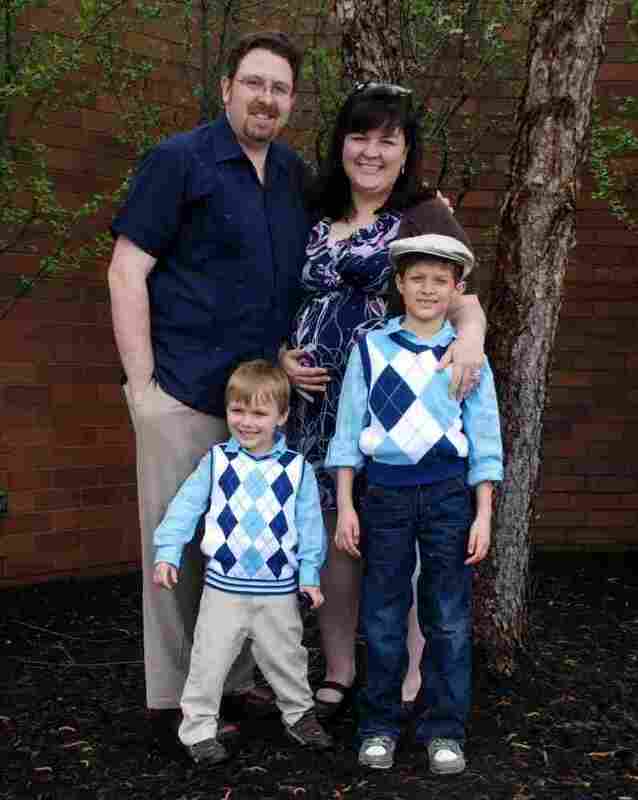 She and her husband, Jeff, also have two young sons who were adopted. That's why the "call for help" jolted me so much. I still wasn't exactly frightened, but I began to get the sense that something just wasn't going the way they planned. And things "not going as planned," while my wife was literally sliced open with several organs hanging out, well, it was enough to pull me away from Elizabeth and rush back to my wife. Andrea smiled at me again. "Is she OK?" she asked. I think Andrea knew that there was some trouble getting Elizabeth out, but she was too tired to worry. We smiled at each other for a second. Then the door to the OR blew open again as another phalanx of doctors and nurses came rushing in. "Look under the table," the new doctor standing by Andrea's head barked to the nurses and assistants. "How much blood do you see?" "I need two over here ... two over there. Move the machine here." He continued to direct his troops. This guy meant business. "There's a lot of blood on the tray. Maybe two. Maybe more." A nurse called out from somewhere under the table. I had no idea what they were doing. Two what? I didn't even have time to respond before two nurses gently pulled me away from Andrea by the shoulders and ushered me out the door. The last thing I heard as I left the room was Andrea. Then the doors closed. The nurses walked me over to the recovery room, where there was a chair I could wait in. "We're doing everything we can. You should be comfortable here. Please know that your wife is right where she needs to be, and has our two best surgeons in there with her." Then I was alone. Very, very alone. It was about the most alone I've ever felt. I just experienced the birth of my two daughters, and now was beginning to believe that something was very wrong with Andrea. But I had no concept of what was going on, only that my wife was apparently bleeding and that I wasn't allowed in the room anymore. I tried to think of my girls, but I had only a few minutes to get to know Natalie, and a few seconds with Ellie. My mind kept going back to Andrea. In the next 10 minutes, I watched in a fog as doctors and nurses rushed in and out of the OR. I heard calls for three units of blood. A nurse who I recognized from the room during Natalie's delivery walked by. She paused to look at me. "I'm so sorry," she said. "They're doing everything they can." Then she walked down the hall. What the hell? Sorry for what? I was now genuinely afraid. I sat in that chair in a cloud of fear and uncertainty that I've never before experienced. Almost a full hour had passed. I didn't want to believe it, but I was convinced something awful had happened. One of the nurses emerged from the OR down the hall and walked almost casually toward me. I couldn't read her expression under her mask and scrubs. Why was there no urgency in her pace? What changed? She pulled her mask down as she approached me. "What's going on?" I blurted. "Why haven't — "
"Let's go into a private room to talk." She spoke softly. At that moment, for the first time since meeting my sweetheart 12 years ago, I considered the possibility that I wouldn't have her anymore. At a thousand blips per second, my mind began to flash images of what life would be like without her. I was beside myself. I was sad. I was broken. The nurse looked me square in the eyes. "She is bleeding a lot. Her uterus won't contract. They have to remove it, or they won't be able to stop the bleeding." She paused. I couldn't tell if she was asking my permission or just informing me. Either way, I was all at once relieved that she wasn't gone, but pissed that the nurse was out here with me instead of in there helping Andrea. "Well, then take it. We don't need it anymore. Help her!" The nurse smiled and started to lift her mask back to her face. But she paused and lowered it again. "In times like this, we sometimes recommend that you call and have a family member here with you." Again my heart jumped. In the span of two or three sentences, I was terrified, relieved, then terrified again. Why do I need a family member nearby? What are "times like this?" I collapsed into the chair and pulled out my phone. And I called the first "family member" that came to mind. My mother. For the next hour and a half I paced back and forth. I decided to go back to the labor and delivery room where only hours before we were both excited and cheering and taking goofy pictures with tiaras and funny scrubs. Mom showed up, crying. Still no news even after two hours. What the hell was taking so long? A nurse appeared at my door. "They have it out. They were able to stop the bleeding. They're stitching her back up now, but we think she'll be OK."
That's what I needed. I could breathe again. I collapsed back into the chair. "We'll have someone bring them to you right away. You can hold them until they wheel Andrea out to the recovery room. It shouldn't be long." Moments later, Natalie and Ellie, wrapped up in the standard hospital-issue white with pink and blue striped blankets, were in my arms. This was the moment that I began to accept that all would be right in the world again. It was still tense in the next hour or so, as it took much longer than expected to "stitch Andrea up." But just after 11:30, she was wheeled into the recovery room. Still waking up, I caught her eyes with mine. "You already met Natalie. Let me introduce you to your daughter Elizabeth." I held Ellie's face to Andrea's. They both sighed. Coming up in the final part of this story: proper introductions, the man who kept watch and coming home.